Grand Theft Auto: San Andreas, released in 2004, is an action-adventure game that is a sequel to the GTA: Vice City. This is the third 3D in the series. The game is set in Los Santos, a city that corresponds to Los Angeles. Gang wars, car modification and other changes have been added to this version. Plot: 5 years ago, Carl Johnson just managed to escape from the pressure of gangs, drugs and corruption in Los Santos and San Andreas. He has to return home after his brother's call telling the murder of their mother. He has to save his still alive family members and takes control of the streets. Remastered graphics: high-resolution graphics have been especially built for iOS users. For instance, Grand Theft Auto: San Andreas is featured with a Shadow mapping or projective shadowing and Render Distance. Thanks to this, the enriched color palette and characters models are greatly improved. Soundtrack: this version grants its gamers with an exhaustive number of tracks. 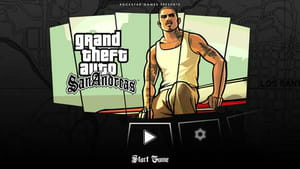 Grand Theft Auto: San Andreas is serviced by eleven radio stations including Talk Radio, Master Sounds 98.3 and others. For this iOS version, gamers can profit from additional radio station that can play soundtracks imported from MP3s. They can listen to their own music while playing the game. Cloud option for saving game support for playing across all iOS devices. It offers a dual analog stick controls. Latest update on September 22, 2016 at 04:50 PM.